Like really, truly love it. If it’s on the menu, it’s safe to say I’m ordering it. 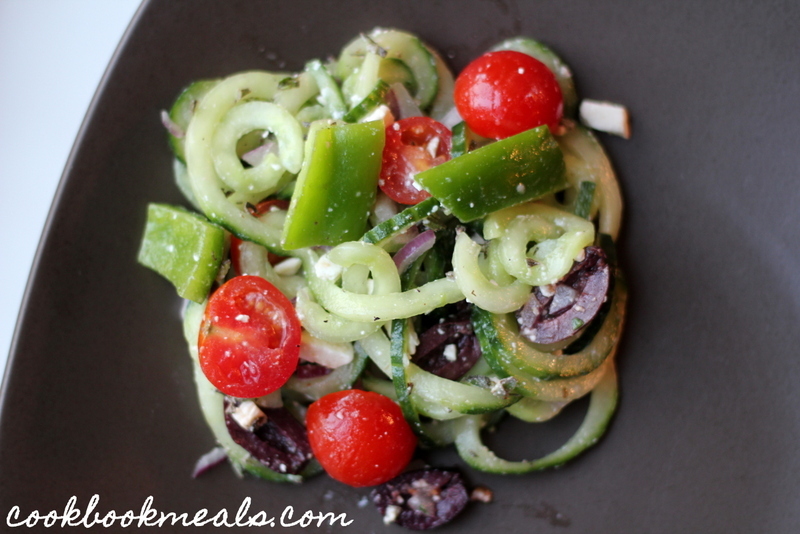 I’ve made several Greek salads before on the blog. 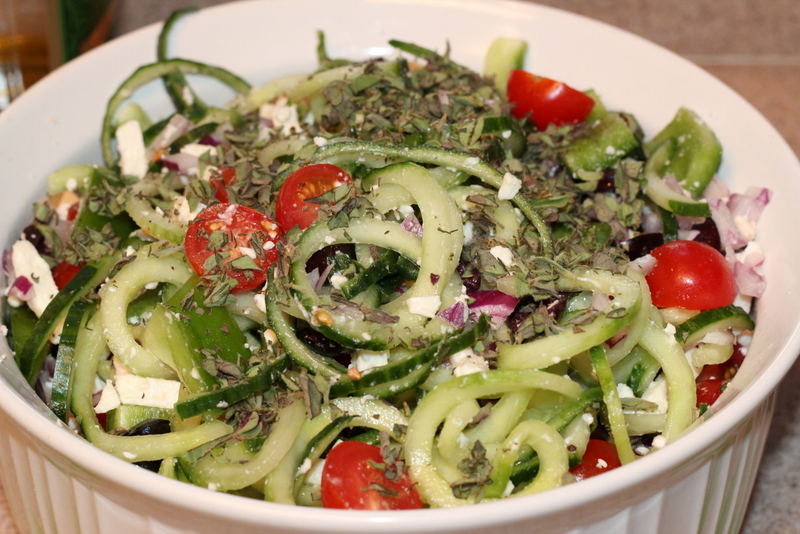 This time, I used my spiralizer (in a new way) to put a spin on the classic Greek salad. 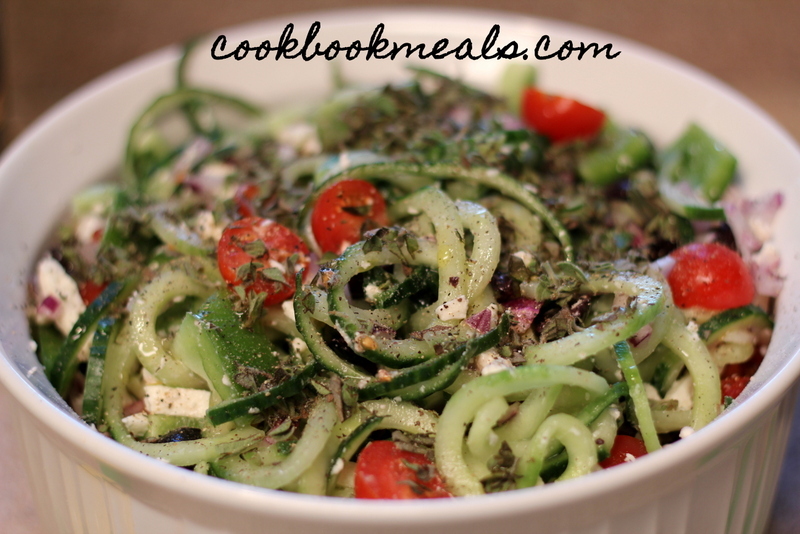 I used the chipper blade (for the first time) to make thick cucumber noodles. The noodles reminded me of buccatini (without the opening, of course) or spaghettoni. 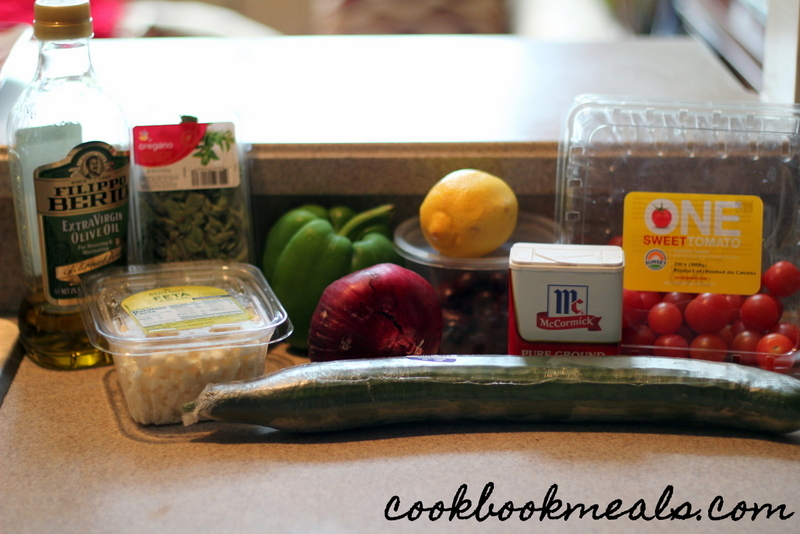 It was the perfect thickness for this salad. 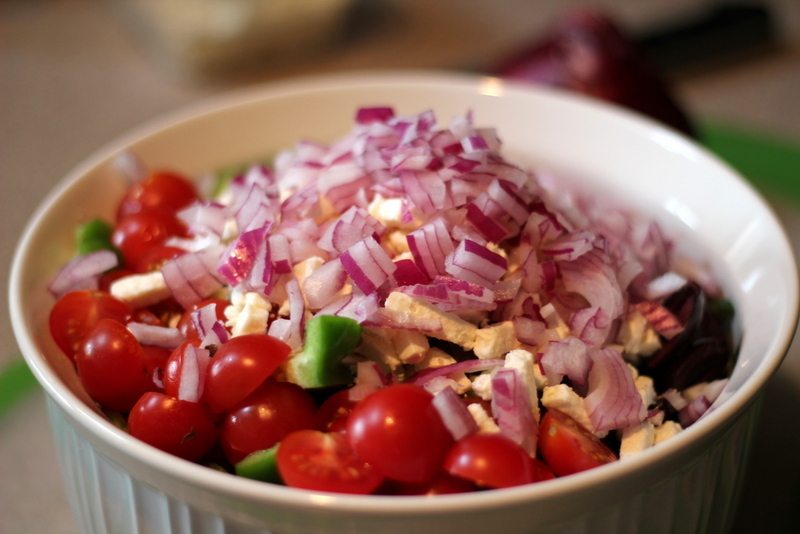 I packed the salad with all my Greek favorites: kalamata olives, tomatoes, oregano, and feta. 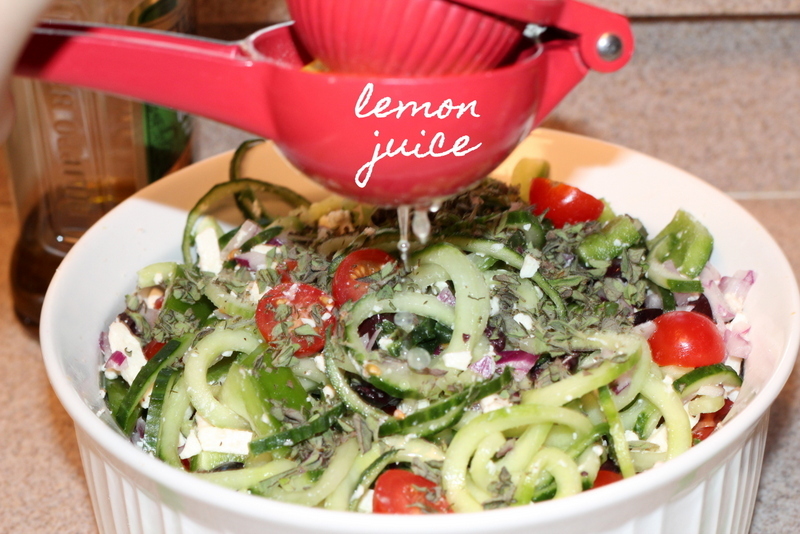 I dressed the salad in a simple lemon vinaigrette, which added the perfect amount of acidity. It was really scrumptious. Just a quick side note: if you have any leftovers (which I highly doubt you will!) you’ll want to eat them within a day. The water from the cucumber will make everything pretty soggy otherwise. You could also not dress the entire salad at once. Instead, just add the dressing to each serving as you eat it, storing the salad with paper towels to help absorb the excess moisture. 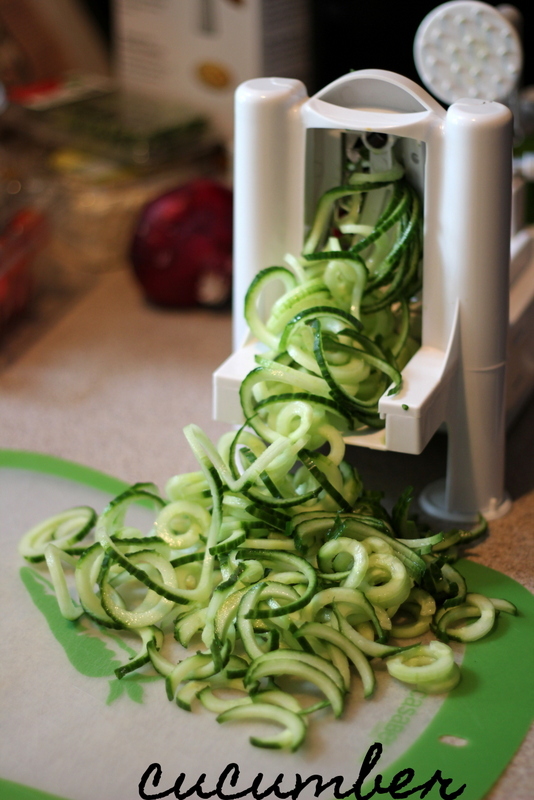 Spiralize 2 English cucumbers through the chipper blade. 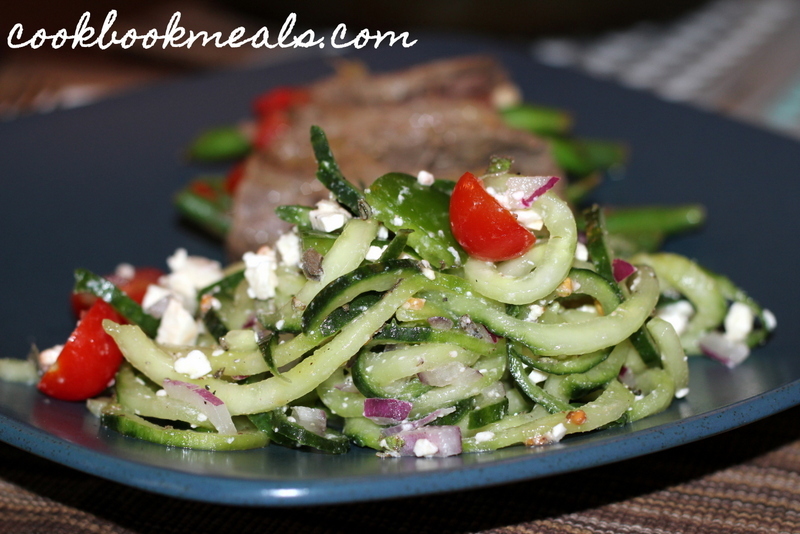 Press the cucumber noodles in between 2 paper towels to absorb excess water. 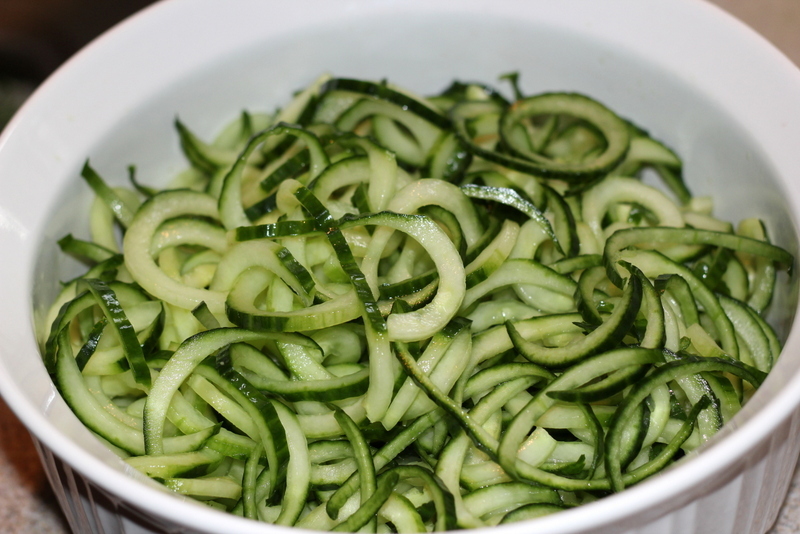 Place the cucumber noodles in a large bowl. 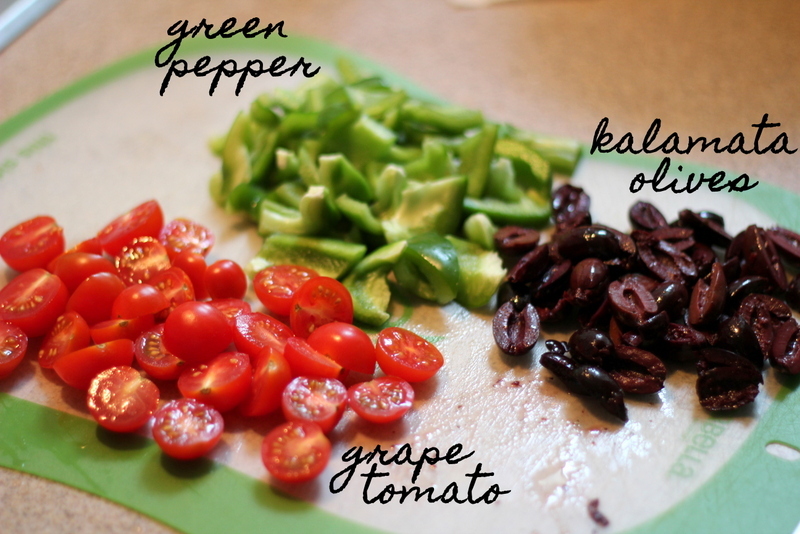 Chop up 1 green bell pepper. 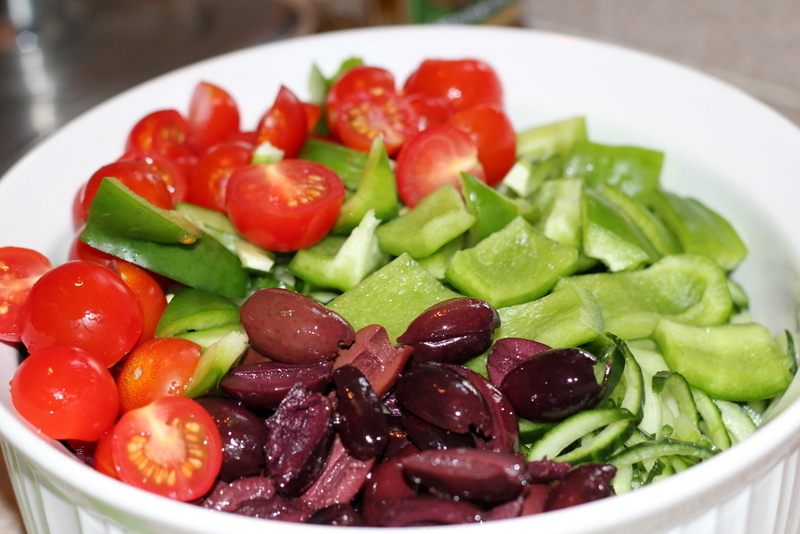 Halve 15 cherry tomatoes and 15 kalamata olives. Add the veggies to the bowl. 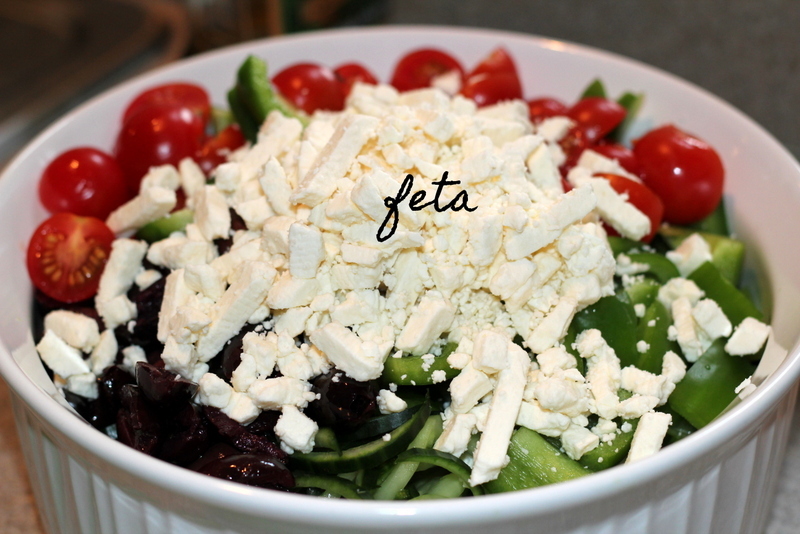 Sprinkle in ¼ cup crumbled feta cheese. 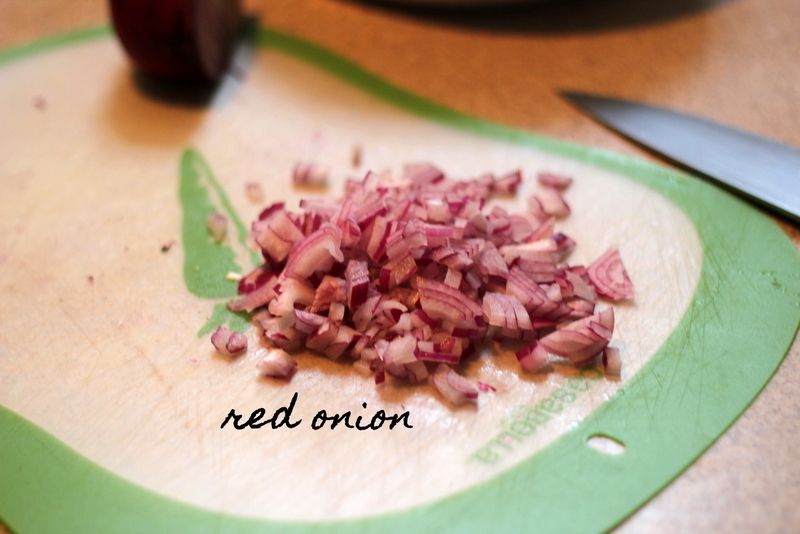 Mince up ½ of a red onion. Add the onion to the bowl. 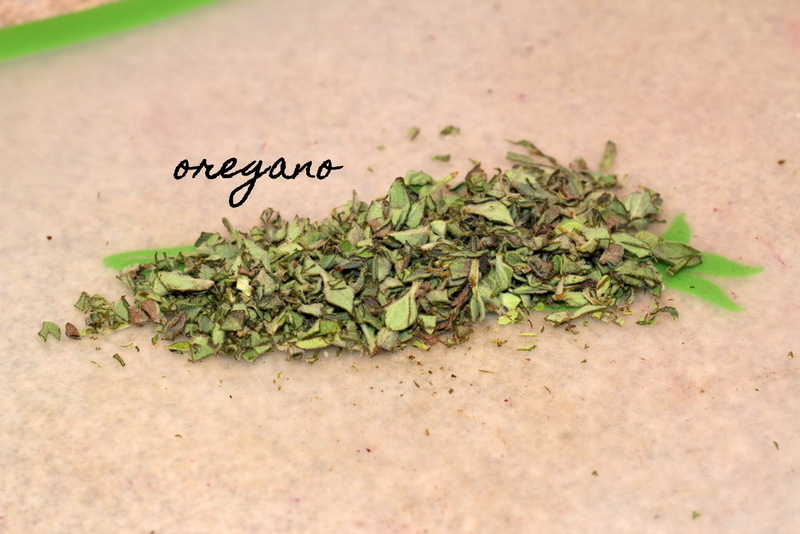 Mince up some fresh oregano. Add the oregano to the salad. Squeeze in the juice from ½ of a lemon. 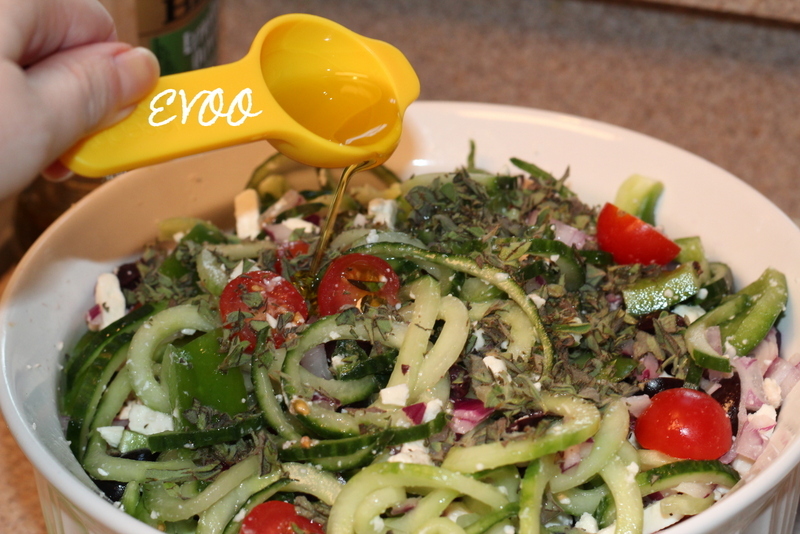 Add 1 tablespoon of EVOO. Season with some ground black pepper. Give everything one last toss. 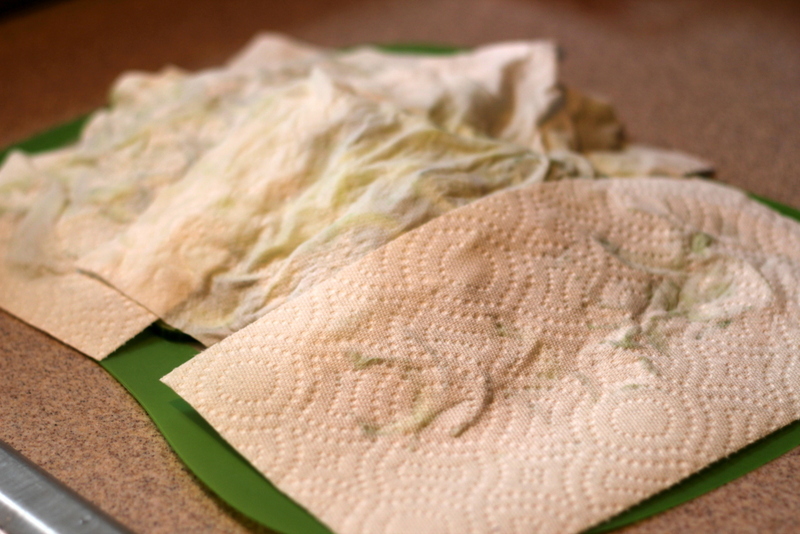 Gently press the cucumber noodles between two paper towels to absorb excess water. 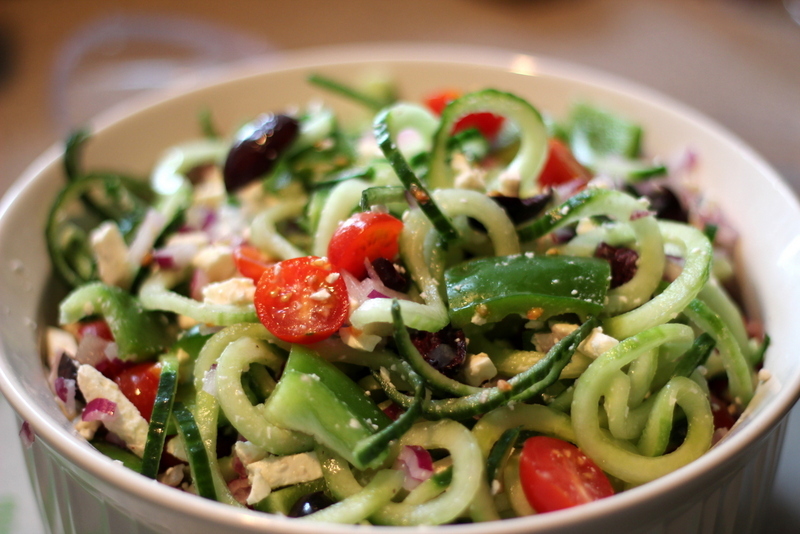 Combine the cucumber, pepper, olives, tomatoes, red onion, feta, and oregano in a large bowl. Squeeze in the juice from the lemon. Toss one last time before serving.